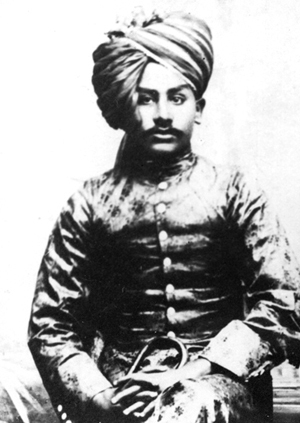 The eldest son of Ustad Allabande Khan, Nasiruddin Khan was already a famous musician in his own right when Zakiruddin and Allabande Khan were alive. He had a soft and melodious voice, and was renowned for his serene and imaginative alap and was especially a great master of shruti- the subtle microtonal shades of notes that establish the flavour of ragas. He could effortlessly demonstrate the subtle shades of notes in different ragas. he was well versed in sanskrit and the shastras, and often quoted from old sanskrit texts to illlustrate the finer points of his music. He would invariably begin a performance with a sanskrit shloka. He had developed his voice with the practice of Nada Yoga to a point where it appeared to blend with the tanpura and become one with it. He trained his younger brothers Rahimuddin Khan, Imamuddin Khan and Hussainuddin Khan apart from his sons Moinuddin and Aminuddin Dagar. Hussainuddin Khan the youngest son of Allabande Khan was almost entirely trained by Nasiruddin Khan. His premature death at the prime of his career had a profound effect on the future develpment of Dhrupad, because it disrupted the training of the next generation of Dhrupad singers. He was called the last of the giants of Dhrupad. S. K. Choubey has referred to him as the last of his race. Unfortunately there exist no recordings of him or of Zakiruddin , Allabande and Ziauddin Khan.